The event will take place in Lisbon on April 8-12 and will be hosted by IST. More information about the INGDIVS project here. This activity will allow the most active experts involved in the project activities(at least one per country) to train around 20-25 professionals from the partner universities and schools dealing daily with gender issues, communication and recruitment. The activity will aim at training these professionals on how to effectively use the final version of the on line profiling toolbox with the different target groups that will be approached locally right after this training session (which can be therefore seen a ”training the trainers” event). 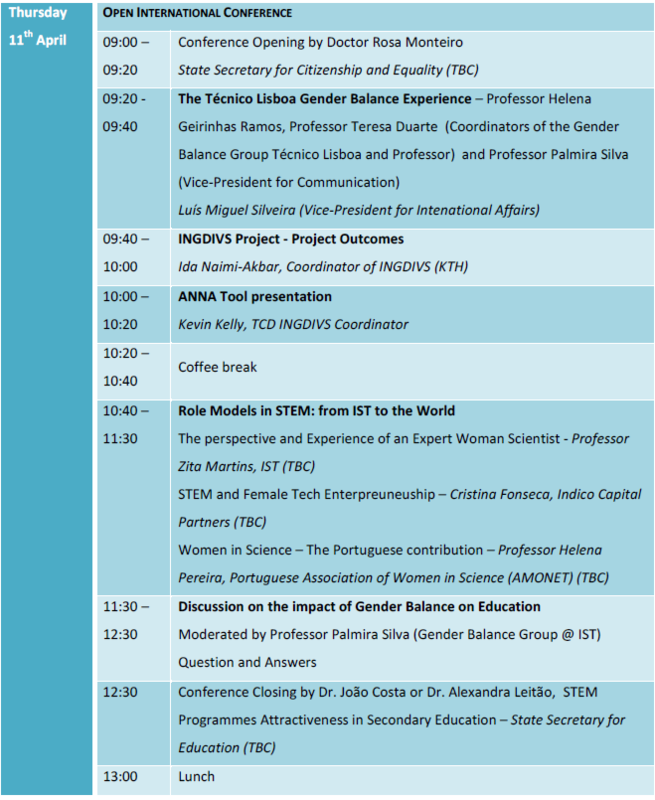 The activity, which will be hosted by IST in Lisbon, will have a duration of 5 days and will also touch all the other aspects and results of the project in order to offer a very comprehensive and broad view on the topic including the different identified tools, state of the art, national differences, best practices and bad experiences, etc. Although the activity might be considered as adult education, the relevant field is without any doubt Higher Education which is the field that will benefit of the outcomes and which will be the field on which the trained professional will focus and operate. VENUE: Instituto Superior Técnico, Alameda Campus (Av. Rovisco Pais, 1, Lisboa) Congress Center Auditorium in Civil Engineering Pavilion, floor -1.